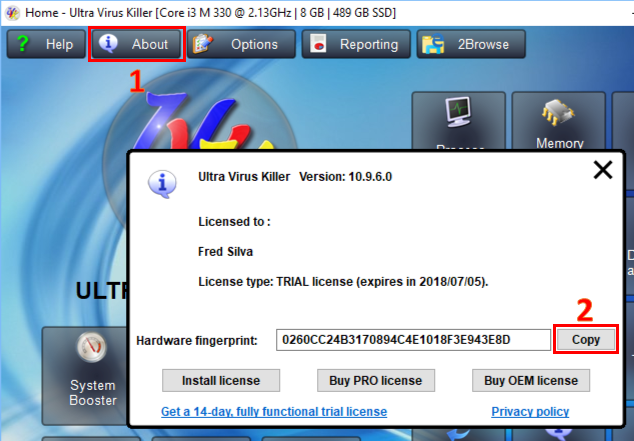 The OEM license will allow you to access all UVK features. Hardware fingerprint: Where do I get this? 1. Launch UVK and then press the About button, at the top of the Window. 2. In the informational dialog box, press the Copy button, to copy the hardware fingerprint text to the clipboard. 3. Paste the copied text in the Hardware fingerprint field above. If you're purchasing from a different device, you can manually enter the hardware fingerprint into the corresponding field.